The Philippine Navy has welcomed two Russian warships that docked in the Southeast Asian country coinciding with Manila’s expressed readiness to shift from relying on the US as its sole and dominant partner in the Western Pacific. The Anti-submarine destroyer Admiral Tributs, along with the sea tanker Boris Butoma, anchored at Manila’s South Harbor on Tuesday for a week long goodwill visit. The Russian marines are expected to discuss and share tactics to help combat terrorism and piracy in the region. Moscow is also eager to conduct joint military exercises with its Philippines counterparts in the future. Philippine Navy officials welcomed the Russian vessels as relationships between the Philippines and its long-term ally, the United States, have somewhat deteriorated in recent months. “There will be courtesy calls, tour of historical places within Manila and nearby Cavite province, capability demonstration, goodwill games, wreath laying, shipboard tour and send-off ceremony among others,” Capt. Lued Lincuna, a spokesman for the Philippine Navy, said. 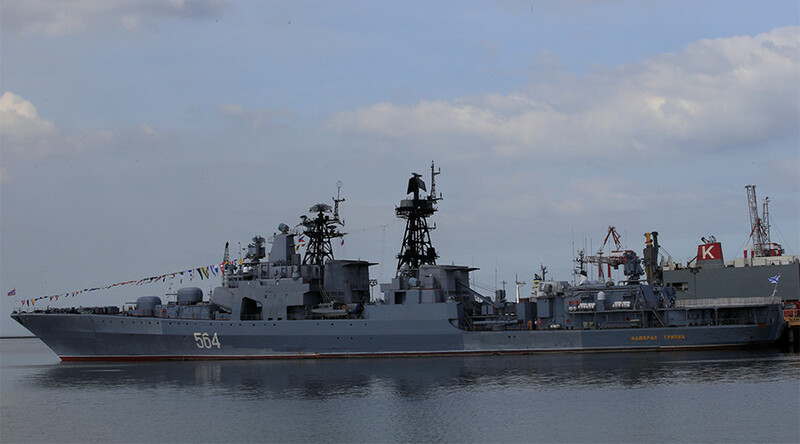 Lincuna also noted that this is the third time a contingent of the Russian Navy has visited the Philippines. But it is the first visit by Russian navy ships since Philippines President Rodrigo Duterte assumed office last June. Russian ships docked in the Philippines in May 2016 and in January 2012. The Russian Navy’s visit comes a month after the Philippines Defense Secretary, Delfin Lorenzana, visited Russia to explore prospects for military-technical cooperation. 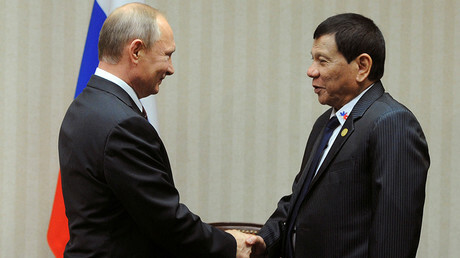 During the Philippines delegation visit to Russia in November to Russia, both countries expressed a willingness to finalize a Philippines-Russia Agreement on Defense Cooperation, after Manila indicated a strong shift in its foreign policy away from the US’s sphere of influence. During a trip to Beijing in October last year, Duterte stressed that he plans to forge closer ties with Russia and China. “America has lost. I’ve realigned myself in your (Chinese) ideological flow and maybe I will also go to Russia to talk to [President Vladimir] Putin and tell him that there are three of us against the world: China, Philippines and Russia. It’s the only way,” he said. Duterte has meanwhile scaled back the number of Philippines troops taking part in joint exercises with the US in the region, and has called the Americans “fools and monkeys” for halting the planned sale of 26,000 rifles over concerns over human rights in the Philippines. Last week, Lorenzana told reporters that Moscow is ready to provide Manila with a submarine and drones, in addition to other military hardware. While turning down the Russian submarine offer, Lorenzana noted that the defense department is looking to purchase Russian made drones and sniper rifles. Speaking at the press conference on Tuesday, Mikhailov noted that Russia can be instrumental at developing Philippines’ naval capabilities in the future.